Thread: another "how would you quilt this"
1)a spiral starting in the center and going out but would I quilt over the embroidery? 4)a circle around the embroidery then rays coming out from there to the edges. Hope someone can follow what I'm saying or give me some other ideas. I am not a very good free motion quilter so simple is best. Sorry for the poor picture, my camera has a scratched lens, and the colors look sick. Hmmm, how about Big Stitch hand quilting with a matching (not black) thread or even a variegated thread with your sunshine-y colors? You could do spirals in each big snowball. Then a scroll like design or two mirror sprirals that join in the middle in each of those sections surrounding the embroidery. 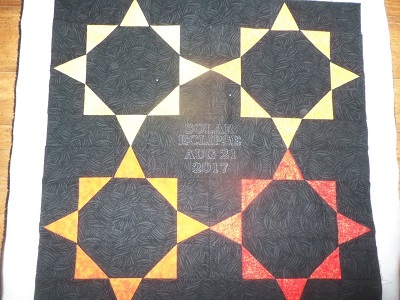 This quilt reminds me of the eclipse. * Very sharp and modern. I like it a lot! Last edited by lots2do; 09-17-2017 at 12:13 PM. How about circling your embroidery and making radiating circles outward. And then do the same with each of your sunbursts? You could have overlapping quilting in the more modern style of quilting, since it is a modern quilt. Good luck & happy quilting. use Angellights suggestion for the embroidery block, then I'd do some type of Celtic knot, or similar motif that would include the whole block on the other black circles. I like that idea. Nice wallhanging too, btw! Thanks for the ideas. I think I will get something to put over the quilt and try out some of the suggestions. Will post pics when completed.